When EA Sports drew up 32 options for Madden fans to vote on to determine who would be this year's cover star, they probably had an absolute worst-case scenario of how the votes would unfold. This is that worst-case scenario. 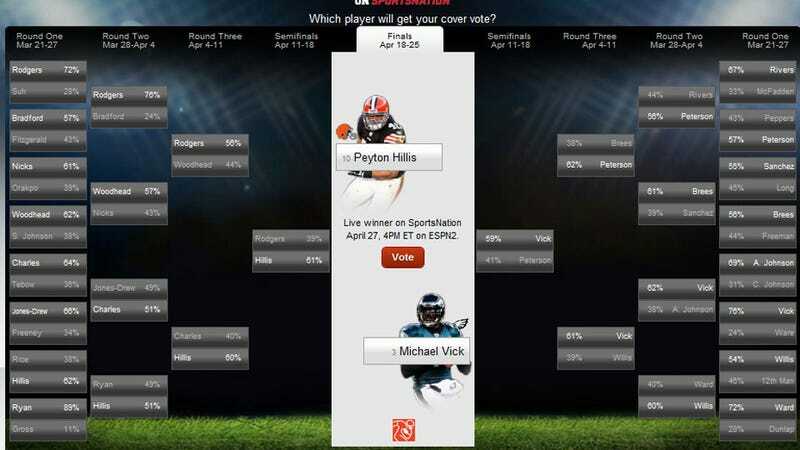 The two finalists - and this is a decision based on public voting, not EA Sports' own decisions - have been decided, and they are...Eagles QB Michael Vick and Cleveland Browns RB Peyton Hillis. Hillis, while not exactly a complete stranger, is not Madden cover material. Especially given the fact he plays for the Cleveland Browns, possibly the least marketable team in the league (don't email me though, I love the Browns). And Vick? Let's put aside the dog-killer argument for a minute, and remember that in spite of that, the guy has already been on the cover of Madden, back in 2003. No player has ever repeated as a Madden cover star, not even the likes of Brett Favre. Players like Tom Brady and Peyton Manning have never been on the cover. Neither have players like Adrian Peterson or LaDainian Tomlinson. or reigning Super Bowl Champion QB Aaron Rodgers. It'd be a shame for some of the game's greats to have never made an appearance while Vick - a great player but also a highly controversial choice - gets a very good shot at his second. Then again, this is Madden we're talking about. They could put an undrafted punter on the box and it probably wouldn't make a lick of difference to the game's overall sales.